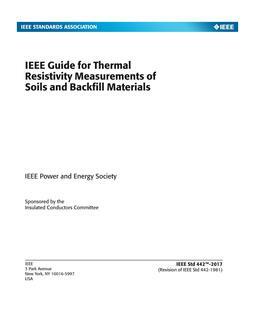 The testing methods covered in this guide include: 1) The measurement of the resistance and impedance to earth of electrodes varying from small rods and plates to large grounding systems of stations. 2) Ground. potential surveys, including the measurement of step and touch voltages, and potential contour surveys. 3) Scale-model tests for laboratory determination of the ground resistance and potential gradients for an idealized design. 4) The measurement of earth resistivity. It is the purpose of this guide to describe and discuss the present state of the technique of measuring ground resistance and impedance, earth resistivity, potential gradients from currents in the earth, and the prediction of the magnitudes of ground resistance and potential gradients from scale model tests. Factors influencing the choice of instruments and thetechniques for various types of measurements are covered. These include the purpose of the measurement, theaccuracy required, the type of instruments available, possible sources of error, and the nature of the ground or grounding system under test. Revision Standard - Superseded. The present state of the technique of measuring ground resistance and impedance, earth resistivity, and potential gradients from currents in the earth, and the prediction of the magnitude of ground resistance and potential gradients from scale-model tests are described and discussed. Factors influencing the choice of instruments and the techniques for various types of measurements are covered. These include the purpose of the measurement, the accuracy required, the type of instruments available, possible sources of error, and the nature of the ground or grounding system under test. The intent is to assist the engineer or technician in obtaining and interpreting accurate, reliable data. The test procedures described promote the safety of personnel and property and prevent interference with the operation of neighboring facilities.